For the area control center referred to in radiotelephony as "Seattle Center", see Seattle Air Route Traffic Control Center. Seattle Center is an arts, educational, tourism and entertainment center in Seattle, Washington, United States. Spanning an area of 74 acres (30 ha), it was originally built for the 1962 World's Fair. Its landmark feature is the 605-foot (184 m) tall Space Needle, which at the time of its completion was the tallest building west of the Mississippi River. Seattle Center is located just north of Belltown in the Uptown neighborhood. International Fountain, located in the middle of the campus, operates all year round. Built for the 1962 World's Fair, the fountain was built as a modernist water sculpture and renovated extensively in 1995. With over 20 spouts, the fountain goes through programmed cycles of shooting water patterns, accompanied by recorded world music. The music is changed twice a month; it is chosen to coordinate with the water patterns and events programming at the center. Seattle Center Armory (known as Center House from the early 1970s until 2012, and the Food Circus from 1962 to the early 1970s), including Center Theatre, the home of Seattle Shakespeare Company and Book-It Repertory Theatre, as well as the Children's Museum, The Center High School and the Academy of Interactive Entertainment. Before the 1962 World's Fair, the building was an armory. Seattle Center Armory is an official city landmark. Fisher Pavilion at Seattle Center is one of the largest rental venues on the grounds and the first City of Seattle building to achieve LEED (Leadership in Energy and Environmental Design) certification. The large, flexible space can accommodate a wide range of commercial, charity and community events. Mercer Arena, formerly a sports, concert, and opera venue before sitting dormant for several years. It is currently being redeveloped as the future home of Seattle Opera. The outdoor Mural Amphitheatre, featuring a mosaic mural by Paul Horiuchi: the Horiuchi Mural, also created for the World's Fair, is an official city landmark. The Northwest Rooms, once a small conference center, now houses SIFF Film Center, The VERA Project and the headquarters of KEXP 90.3 FM. Seattle Center Pavilion, adjacent to KeyArena; it hosts a wide variety of trade shows, meetings and community events. Seattle Center Skatepark, aka Sea Sk8 Park, is located at the entrance at Thomas St. and 2nd Avenue N.
A piece of the Berlin Wall can be seen at the Seattle Center Armory Food Atrium. View of the Space Needle with the International Fountain in the foreground. Kreielsheimer Promenade and Marion Oliver McCaw Hall, Seattle Center. Monorail tracks entering the Museum of Pop Culture (MoPOP) building. The towers of the Pacific Science Center at night. MoPOP and Space Needle seen against the backdrop of the Seattle waterfront and Puget Sound. Marion Oliver McCaw Hall, home of Seattle Opera and Pacific Northwest Ballet, whose ballet school is adjacent. This is the third performance space on this site, the second being the Opera House built at the time of the World's Fair. SIFF Cinema, the year-round home of the Seattle International Film Festival, features world cinema all year, as well as during the regular Festival Season in May and June. Memorial Stadium, a high school football and soccer stadium, which predates the World's Fair is the home of Seattle Reign FC of the National Women's Soccer League (NWSL). Seattle PrideFest is the Official Seattle Gay Pride Festival held annually at Seattle Center over Pride Weekend. The festival takes place on the last Sunday in June between 11am and 7pm. This event used to take place in neighboring Capitol Hill's Volunteer Park but eventually outgrew its residential location. It was decided to move the annual parade to downtown and festival to the Seattle Center to better accommodate the growing attendance. There is a long history of consecutive plans for physical revision of Seattle Center. Ever since Seattle City Council approved the Seattle Center Century 21 Master Plan in August 2008, it has effectively directed physical change on the 74-acre campus. This future-looking, 20-year plan sets forth 10 planning and design principles to effectively guide redevelopment. Completed first phase projects were realized through an innovative mix of public and private funding. They include: Seattle Center Skatepark, Broad Street Green, Seattle Center Armory (partially complete), Theater Commons, Chihuly Garden and Glass and Artists at Play (playground). Halfway through its 20-year duration, the Master Plan is primed to respond to some significant external changes, alongside exciting new opportunities on the grounds, to continue physical transformation at Seattle Center so that this unique urban campus can continue to accommodate the needs and desires of the broader community for many generations to come. 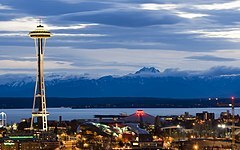 ^ a b Landmarks Alphabetical Listing for S, Individual Landmarks, City of Seattle. Accessed 28 December 2007. Wikimedia Commons has media related to Seattle Center. "Seattle Center", p. 18–24 in Survey Report: Comprehensive Inventory of City-Owned Historic Resources, Seattle, Washington, Department of Neighborhoods (Seattle) Historic Preservation, offers an extremely detailed account of the history of the buildings and grounds. This page was last edited on 12 April 2019, at 19:30 (UTC).